← The News has arrived!! Pie Sales are coming to a Close! Last chance to buy a pie or two to ease your holiday stress! 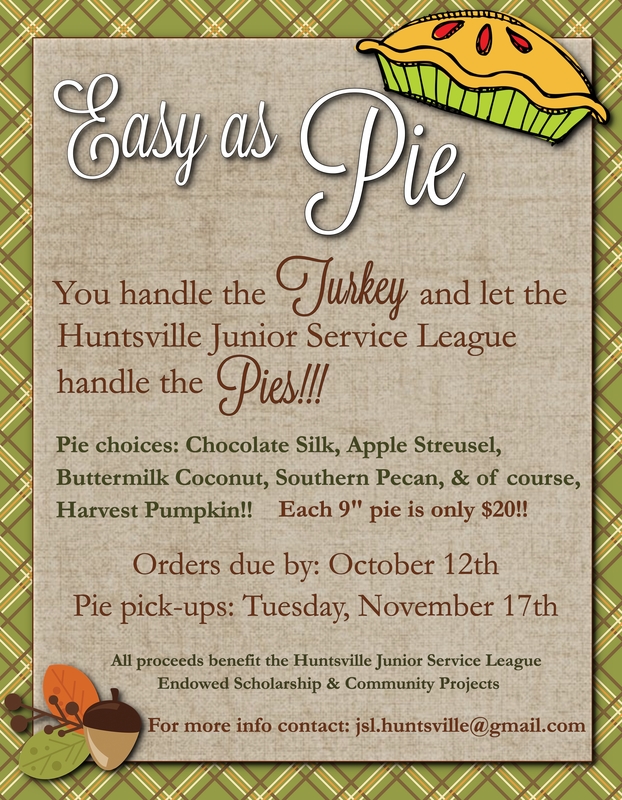 Our pie sales forms must be turned in tomorrow, so be sure to contact your favorite JSL member to order to fabulous pies from Pie in the Sky Pie Co. We are selling 9 in. fully baked frozen pies for only $20. Five flavors are available – Apple Streusel, Harvest Pumpkin, Southern Pecan, Chocolate Silk, and Buttermilk Coconut. Want to support the works of Huntsville JSL, but don’t see your favorite flavor listed?? No worries, you can purchase a $20 Pie in the Sky Gift Card and pick up your very favorite at the shop in Conroe. How does Lemon Cream, Coconut Cream, Bumbleberry, Key Lime, or Mississippi Mud sound? Eating healthy and cannot fit pie into your meal plan? How about a nice lunch with close girlfriends at the Pie in the Sky Co. restaurant in Conroe? Use your $20 gift card on a wonderful lunch. These menu items are just a small sample to the fabulousness they offer….Lime Cilantro Chicken Sandwich, Apple Walnut Salad, Grilled Veggie Wrap, and Chicken Pot Pie. For their full menu options, check out their site here. Once your mouth is watering, call your neighborly JSL member right away! Sale forms will be turned in Monday evening (October 12). All funds raised will help fund our local charitable programs and Endowed Scholarship fund. Thank you to all who loyally support the Huntsville Junior Service League! !